Focus on the Gospel was established to encourage the proclamation of the Gospel of Jesus Christ from the pulpit and other places. We combine ancient and timeless methodologies with modern media to offer a variety of resources that will help pastors and laymen to accomplish that mission. The founder of FOTG is the Rev. Steven L. Anderson, Pastor of Immanuel Lutheran Church in Grand Mound, IA. Pastor Anderson has a background in education and theology. In 1981, he graduated from Concordia Teachers College, River Forest, IL, (now Concordia University Chicago) with a B.A. in Education. He continued his education at Concordia Theological Seminary, Ft. Wayne, IN, earning a Masters of Divinity degree in Exegetical Theology in 1985. After Ordination, he served for sixteen years as a sole parish pastor at churches in Wisconsin, Missouri, and Kansas before moving to Colorado, where for two years he worked in a Lutheran high school, where he served as Dean of Students, Director of Recruitment, Instructor, as well as Associate Pastor. In the fall of 2002 he began his work at Christ Lutheran High, QCA, where he served as Principal and Administrator, while continuing to spend a great deal of time in the classroom as a teacher. During that time, and after the school closed, he served as vacancy pastor at several different area churches. He also held several Let’s Talk about Preaching workshops for pastors. Pastor Anderson has written papers for theological conferences and he is the author of several periodical articles and one book. The book has been revised, improved, and re-titled. In Johnny Can’t Preach…But Jimmy Can, Pastor Anderson articulates how using old methodology and new technology has helped him to develop his unique preaching style. 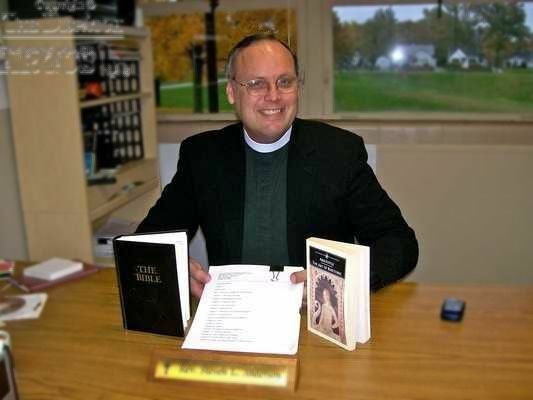 He is currently serving as Pastor at Immanuel Lutheran Church in Grand Mound, Iowa. He and his wife of thirty-five years have three grown children, one grandchild, and they maintain homes in Sherrard and Byron, IL and Grand Mound, IA.